As of Aug. 6, you should be able to get more of both. Current law has strict restrictions on the ability of Arizonans to get wine from out-of-state vintners that might otherwise not be available here. In many cases, they actually have to go to the winery to place the order to have it shipped. Now, Arizonans will be able to place orders by phone, mail or even online. Initially the limit will be up to six cases. That will increase to nine in 2018, and a dozen cases starting in 2019. There are some restrictions, including a requirement for the seller to obtain proper identification to ensure the recipient is at least 21. That includes whoever is doing the delivery must inspect a valid photo ID of the recipient. And getting free booze will also get easier: A separate measure eliminates the requirement that beer and wine stores be at least 5,000 square feet before providing samples. Potlucks are a different issue. In general, state health regulations cover situations where food is sold. There is an exception for a “noncommercial social event,” a definition that does include potlucks. But that exemption applies only when the event is at a workplace, making a gathering of folks at the local mobile home park illegal. As of Aug 6, neighborhood potlucks also will fall under the exemption. On a related front, another new law spells out that the health department no longer can regulate food grown in school gardens if it is prepared and used on site. And, on the subject of the health department, agencies that procure organs for transplants will have to be licensed. Several measures dealing with education also gained legislative approval. One limits the ability of schools to use assessment tests that seek personal information. Another requires the state Board of Education to prepare a list of academic assessment tests that schools can use rather than the one now mandated. And lawmakers forbid local school boards and interscholastic organizations from prohibiting students from wearing religious or cultural accessories as long as they do not create health or safety issues. At the higher education level, one new law prohibits state colleges and universities from limiting student protests to certain “free speech” zones. A similar measure spells out the right of students to free speech. That second one also makes it illegal to block someone from going to a government meeting or political rally. That followed efforts by protesters earlier this year to keep people from going to a Donald Trump rally in Fountain Hills. It also wouldn’t be an Arizona legislative session if there were not some new laws dealing with guns. In the first category, lawmakers created a new exception to existing regulations that allow colleges and universities to ban weapons on campus. Now, individuals need not disarm themselves if they are on a public right-of-way going through the campus. They also approved two separate measures designed to keep local governments from enacting any of their own rules, something that, at least on paper, is already illegal. 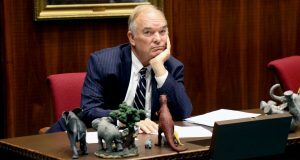 It’s aimed largely at Tucson, which has refused to repeal two gun regulations that former Attorney General Tom Horne concluded in 2013 are beyond the city’s authority. One requires people to report the loss or theft of a gun to police; the other allows police to request a breath sample from someone who has negligently discharged a firearm and appears intoxicated. The new state law provides some teeth, allowing a judge to assess a penalty of up to $50,000 from a knowing or willful violation of state preemption as well as removing public officials from office. And if that’s not enough to get the attention of recalcitrant city officials, another new law allows any legislator to ask the attorney general to investigate whether a local ordinance or policy is contrary to state law. But the real key is that if the city does not come into compliance within 30 days, the state treasurer would be required to stop providing revenue sharing dollars, money that makes up a large share of each city’s operating budget. The breadth of that law actually goes beyond guns, covering any situation where the attorney general says a city has tread into forbidden territory. And that could cover the decision of the city of Bisbee to enact regulations on plastic bags, a regulation that lawmakers voted, once again this year, to declare illegal. Along the same lines of the state squelching local control, another new law bars cities and counties from doing anything to increase the regulatory burden on a person unless there is a critical or urgent need not already addressed by state law. Meanwhile, animals will get some new protections. Lawmakers told local governments they cannot ban the sale of commercially bred dogs and cats despite testimony that even those raised at federally inspected facilities are not humanely treated. That killed ordinances already adopted in Phoenix, Tempe and Tucson. But they did agree to require pet stores to obtain their animals only from breeders approved by the U.S. Department of Agriculture. And another law makes it illegal to harass, shoot, injure or slaughter a horse that is part of a wild herd along the Salt River. Separately, the Legislature altered laws that govern service animals, specifically allowing businesses, especially restaurants, to tell an owner the animal has to go if it is out of control or not housebroken.